Asia’s hottest idol group Super Junior set a new record, becoming the top artist to sell the most albums over the past 3 years. The ‘2011 Singer Awards‘ reflects the artists that sold the most albums according to sales data from Hanteo, and Super Junior sold 355,900 albums between January 1st, 2011 and December 27th, 2011. Super Junior’s cumulative album sales (of all 32 singles and albums they’ve released to date) for 2011 amounted to 350,000 units. This was the highest number of sales since the ‘Singer Awards’ were established back in 2009. Seo Taiji boasted 248,800 units in 2009, while Girls’ Generation set a new record last year by moving 309,400 units. Super Junior’s full length album ‘Mr.Simple‘ was a big factor that contributed to their impressive sales numbers. ‘Mr Simple’ Type A alone sold 199,300 copies while Type B sold 53,500 copies and their repackaged album sold 73,900 copies. All together, their fifth album alone sold 326,800 units. Behind Super Junior was TVXQ who sold 230,000 units and Girls’ Generation who sold 226,700 units. The two names that stood out on the list, however, were INFINITE and IU. The boys of INFINITE came in at 7th place selling 124,100 units while singer IU was the only soloist to break the top 10, selling 92,900 units at #9. Hanteo charts calculates the data by collecting 85% of their information from nationwide music sales and 15% from accumulations in their own information database along with national sale estimates. 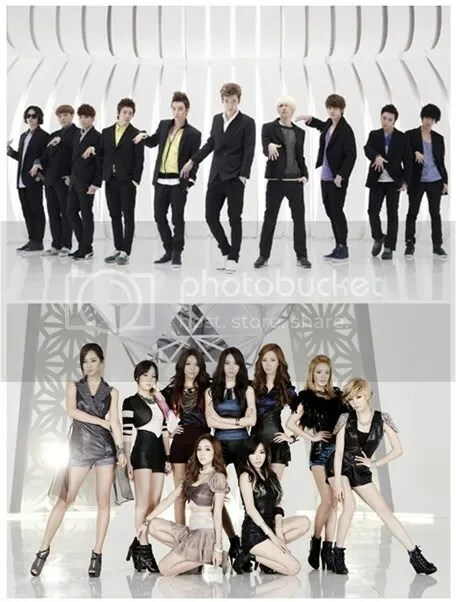 Super Junior and SNSD have become the best-selling boy group and girl group of 2011. On December 28, Hanteo Charts, a website that researches album sales, announced, based on its 2011 Singers’ Awards, that Super Junior have sold total 355,915 copies from January 1 to December 27 2011. Debuting in 2005, Super Junior ranked first by having sold over 300,000 copies of total 32 albums released until now. After ranking second on this chart last year, they finally ranked first this year. Super Junior released their fifth album, Mr. Simple, in August, and have sold 199,329 copies of A type and 73,969 copies of its repackaged album. They also became the best-selling artist with this album this year. SNSD, who ranked first on the Hanteo Singers’ Awards last year, sold total 226,769 copies this year and ranked first among female artists and third out of all. Debuting in summer 2007, SNSD have sold over 200,000 copies of total 44 albums released until now. SNSD have sold over 130,000 copies of their third domestic album, The Boys, released in October. In this research, TVXQ, who released Keep Your Head Down in this January, ranked second among male artists and also second out of all. Debuting in 2004, TVXQ have sold total 230,897 copies of 136 albums released until now. This shows that three artists from SM Entertainment ranked from first to third on the 2011 Hanteo Singer’s Awards. On the Henteo Singers’ Awards, Big Bang (221,175 copies), Kim Hyun Joong (212,191 copies), JYJ (188,481 copies), Infinite (124,130 copies), B2ST (112,598 copies), IU (92,988 copies), and 2PM (90,719 copies) ranked from fourth to tenth. Among them, new boy group Infinite is attracting attention. Infinite have sole over 80,000 copies of their first album, released in this July, and a repackaged album. The ranks of Hanteo’s Singers’ Awards are based on the year’s total sales of all albums of each singer (or each group). Hanteo Charts collects all sales data from major record stores and internet shopping malls and counts the data, considering them as roughly 85% of the total sales. Taking all variables into account, it determines the total sales by comparing and analyzing all collected data and estimating the rest 15%. However, agencies’ total sales data are different from Hanteo’s because they count them by checking the number of albums released and data from record stores. The number of sales announced by the agencies is usually 1.5 times more than Hanteo’s. Hanteo, one of the top album sales monitoring charts in Korea, has released their ’2011 Singer Award’ rankings. Super Junior clinched 1st place with an overwhelming lead over all the other groups this year (~322,000 copies sold). Second place went to Big Bang (~217,000), while TVXQ has seized the 3rd spot (~201,000). They were followed by Kim Hyun Joong (~200,000) and JYJ (~158,000) for 4th and 5th places, respectively. As expected, idols dominated album sales this year due to their large, dedicated fan bases. In addition, the top 5 are all male idols, with Kim Hyun Joong being the only male solo artist out of the five. This chart is scheduled to be updated until the end of this year. However, with less than two months left in the year, it’s not likely that the rankings will change (with the exception of TVXQ and Kim Hyun Joong who are currently neck-and-neck). Even if you have got the albums and able to buy more, please do!!! Ajaa!! !